Ok, so I know I said I'd stay away but had to pop in... Today's google was the prettiest I've ever seen!!! Apparently they're called "Google Doodles" (who knew?) 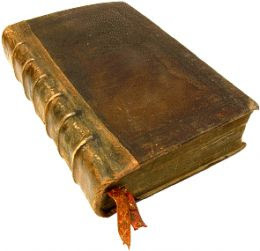 and today's is celebrating the 366th birthday (odd day to celebrate--- hope someone remembers mine! 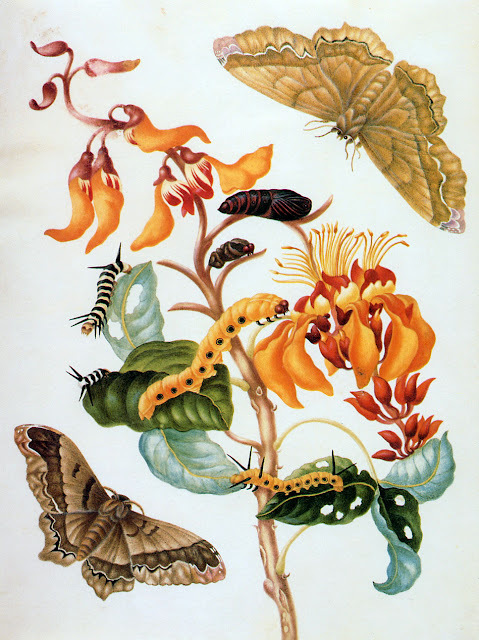 ;) of Maria Sybella Merian (1647-1717). 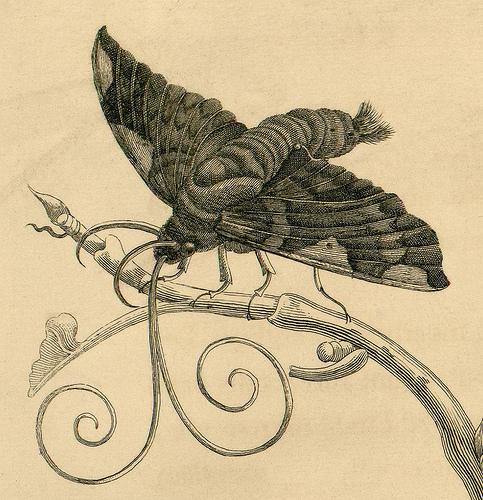 Merian was one of the greatest naturalists of her time. "After her father's death, her mother married the still-life painter Jacob Marrel, who trained her as a flower painter. 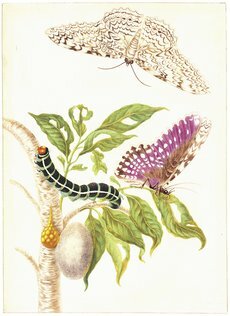 At the age of 13, Merian painted the transformation of silkworms into moths. 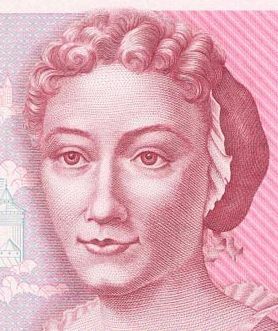 Perhaps this was the beginning of her passion and her first hand observation of insect metamorphosis which later paved the way for her groundbreaking discoveries." "...Although certain scholars were aware of the process of metamorphosis from the caterpillar to the butterfly, the majority of people did not understand the process. The work that she published was very popular in certain sections of high society as a result of being published in the vernacular, but her work was largely ignored by scientists of the time because the official language of science was still Latin. What I wouldn't do for that book!!!!!!!!!!!!! Recently I was working on putting a collection of what I thought of as "botanicals" together for a client and noticed that the artist whose work I was pulling from (Merian) was using lots of critters & bugs in the flower illustrations, which I thought was so unique. (I have a botanical obsession and so anytime I find some that are different, I get really excited!!!) I had no idea she was female (All I had to go on was "Merian") and or that the bugs themselves were her true focus/ passion. I also didn't put two and two together that I'd used her work on other projects before because they'd been fish and not botanicals. I was so surprised to look into the google doodle today and find so much information about this artist whose work I've loved & used in the past. I could definitely be one of those rich old men who collect rare books in a massive home library... (If I were an old man or rich ;) And I'm perfectly fine smattering naturalist drawings on the walls of almost every room in my house... 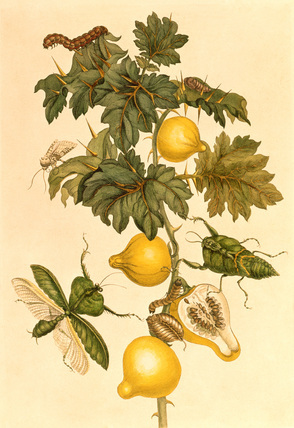 There's not much I find more beautiful or thought-provoking than botanical/ nature studies and there are so many incredible sources & artists out there. I looks like one of your fabrics! Lauren- What a wonderful story and an exceptional woman! The illustrations are gorgeous - what an amazing talent for drawing she had. Like you, I am obsessed with botanicals and I always love them more when they were created by a female artist. Although few got funding, there were numerous women working in this field - all that watercolor painting training gave them great skill. Enjoy your vacation! I've been obsessed with that doodle all day! Isn't she fascinating? I knew you'd love the illustration, too ;) Hope you're having a wonderful spring break with your boys! So fascinating! Loved learning about this artist and seeing her work. Thanks so much and have a great spring break! I love the etches you included in your post though--so beautiful. Her work does remind me of your fabrics. Lauren!! 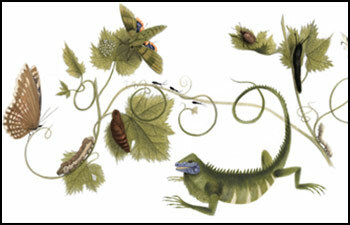 I read the google doodle as soon as I saw it because it was so beautiful. So it was so nice to see your post. I am always touched when I read about women in previous centuries who had careers and supported themselves and travelled and didn't have to marry etc. I think I was always independently minded myself and I never wanted to get married until it was too late haha. I love that you love her work. I think it's amazing that you already used it without knowing. In this rushed day and age, it is easy to see some pretty art and forget there was or is a whole life behind it, a whole beautiful story. I think in a past life you were an old man naturalist. I am sure of it, with all your beakers and botanicals. Did anyone notice that on Easter Sunday Google chose to remember Cesar Chavez instead of Jesus? I've been "Yahoo ing!" ever since. girl, you need to design a fabric incorporating moths etc. LOVE! 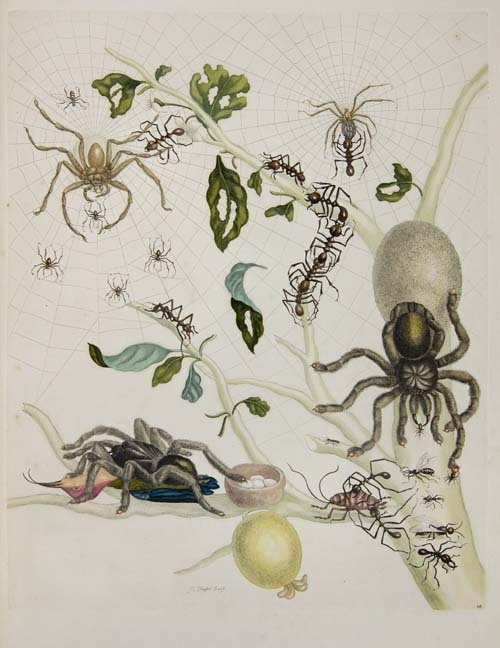 Lauren, since you live in the Washington, DC area, I thought you would like to know that the NATIONAL MUSEUM OF WOMEN IN THE ARTS has a collection of about 375 prints by Maria Sybella Merian. There are usually some on display in their Permanent Collection, always on view. NMWA is in downtown DC, at 13th & New York Avenues, a block or two from Metro Center. She was truly a remarkable woman for her time--and her influence is still seen in contemporary fabric design. Thanks for sharing this find with your readers! Hi again Lauren. I promise this will be my last comment on this post! I just wanted to forward you a little blog that I love and get so many recommendations from. 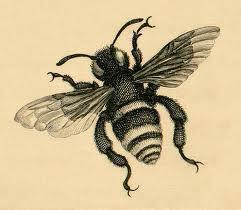 Sarah sort of curates really interesting artisan stuff of all kinds (monogrammed stationery, folk art, hand crafted furniture, etc) and this is where I originally heard of Merian's work. Fabulous post!!!! I love learning new things and I was not aware of this incredibly talented lady. I cannot wait to explore more about her. Hello! 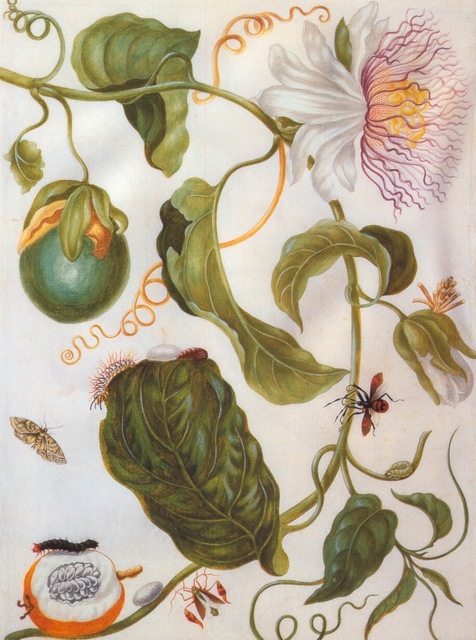 So funny you posted this because just a few months ago I ordered a book titled "Amazing Rare Things: The Art of Natural History in the Age of Discovery" and the picture on the cover is of the passion flower illustration. The book has gorgeous pictures in it. Also read your other post about chickens. I live on a small farm outside of Richmond and have free ranging chickens. They are so much fun! Hope you can get some. Your boys would love them! Her work is amazing! We actually have the book in the library I work at and used her images in an exhibition and for notecards, posters, etc.